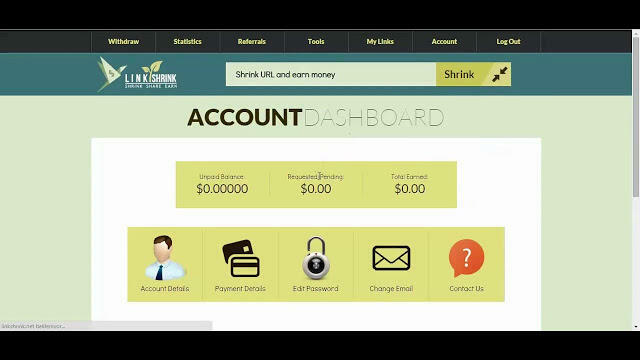 Link Shrink is the fastest and simplest way to earn income online, specifically designed to start earning money within minutes. Our innovative system brings together web users and advertising companies in a way that is beneficial for everyone. Between the many extra cash making way, Shorten Links is the one of the best and the easy to get more profit. so only I write more about this article. Only you need is the good traffic in your blog or social networks. Payments: Get paid within 4 days of requesting your money! Request your income once you reach at least $5. Website Scripts: Planning on bringing traffic from your site? Implement our small scripts to monetize your traffic. Highest Rates: Make the most out of your traffic with our always increasing rates. Referral Bonus: Invite friends to this and earn 20% of their earnings! Link shrink is a typical type of URL shortens which has been used by many of website. You can get money when you get 1000 views on your link. You just have to shorten your regular URL and paste that shorten the URL to any normal website or social media sites. If you don’t have any site then you can also use this method. Just shrink other website links. This is a cool method for those who want to learn from their home. 3) Now your URL is shrunk ( shorten ) now just paste that URL into your own site or blog. 4) If you have no website or blog, then paste your link in the social media websites like facebook, twitter, Google+ or even in the WhatsApp. 5) Now more the page views of your link, more the money you will get. sources back to your webpage? My blog is in the exact same area of interest as yours and my visitors would certainly benefit from a lot of the information you provide here.